A respirator seal check (also known as a pressure check or fit check) is a very different procedure than a fit test. A seal check determines the effectiveness of the seal between the respirator and the skin, and must be done EVERY time the respirator is worn. Two common ways to check the seal are the positive seal check and the negative seal check. 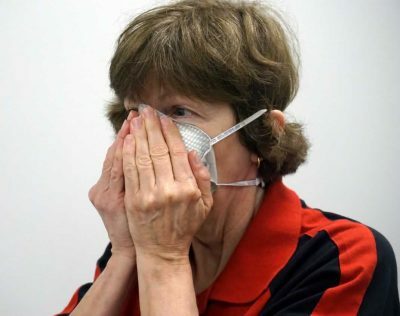 For a half-mask cartridge respirator, place the respirator on your face, then pull the top (halo-shaped in some models) plastic strap and adjust it over and on top of your head. Next, connect the straps that go be­hind your neck, and pull the loose ends of the straps to adjust for comfort and fit. When the seal seems tight, perform the seal check. Cover the exhalation valve on the front of the respirator and gently exhale. If you can do this without feeling a rush of air around the faceplate, the seal is good. If you feel air leaking under the facepiece, re-position and repeat the check until the seal is effective. Cover the inlet opening of each of the cartridges with your hands and inhale gently so the facepiece collapses. Hold your breath for about 10 seconds; if the facepiece stays col­lapsed, the seal is effective. If you can do this without feeling a rush of air around the faceplate, the seal is good. If the facepiece expands or air leaks under the facepiece, re-position and repeat the check until the seal is effective. Positive (left) and negative (right) seal check. UNL photo. For a disposable particulate filter mask, put on (don) the mask. Some have a piece of metal along the nose bridge. With both hands, press your fingertips on the metal band at the nosepiece. Press down while moving your fingers along the mask from your nose outward. This will mold the mask to fit your face. To check the seal (image below), put both hands over the respirator completely and inhale sharply. You should feel the mask tighten against your face (negative pressure). 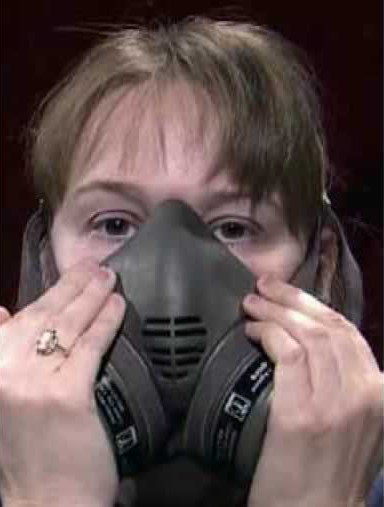 If air leaks under the mask, adjust the nosepiece or straps. If you can’t get a proper seal after re-positioning the mask, try another style of respirator. Seal check of a disposable particulate filter mask. If the facemask has breaks or damaged portions that would prevent a good seal, replace the respirator. If you cannot get a good seal with any other respirator, use a loose-fitting respirator or choose an alternative pesticide that does not require a respirator.